Before I start with the post, I wanted to just give a BIG “thank you” to everyone who wrote a review for Super Paleo Snacks on Amazon, Barnes & Noble, or Goodreads. You know who you are and I hope you know just how much I appreciate YOU and your amazing support!! Okay, sorry, enough with book stuff. So, another resolution of mine this year is to eat more wild fish. I’ll admit that I don’t make fish often. When I do, the boys in this house tend to turn up their noses. But, this fish was so tasty! So guess what? The kids (and dad) are going to have to get used to eating fish. It’s never easy introducing a new food, but the more I do it, the easier it seems to get. It may not be their favorite meal, but it’s hard to please everyone all the time, right? It’s all about consistency and follow through. We have two big rules in our house at dinner time. 1. You have to try at least one bite of everything on your plate (yes, even if you are going to gag) because you never know if you are suddenly going to like it. Taste buds are changing ALL the time. It’s a rule that my kids have come to accept. Once they realized that it was a rule that was never going to change, it really became a non-issue, thankfully. 2. Whatever I make for dinner, is dinner. There are no second dinners or “kid meals”. If you don’t want the dinner I made, that is fine, you may be excused. But I will save it for later for when you realize you are hungry and want something to eat. Don’t worry, your dinner will be waiting for you. 🙂 After 3 nights in a row, your kids will know you mean business. I promise, they won’t starve because you don’t make them exactly what they want. Stir together lemon juice, olive oil, crushed garlic cloves and salt and pepper in small bowl to blend and set aside. 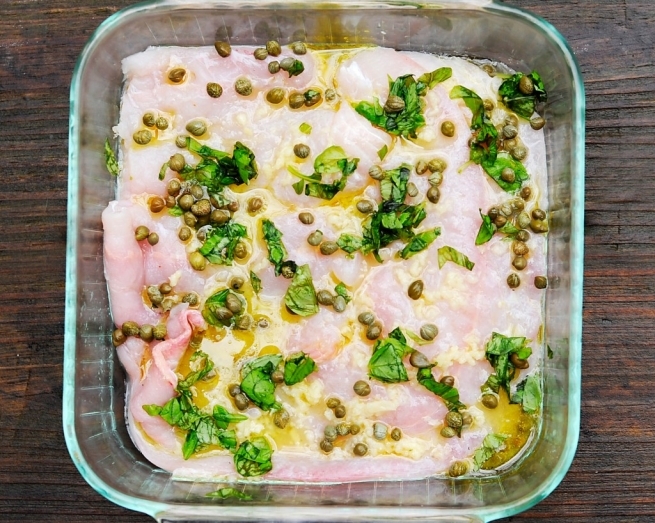 Add fresh basil and capers on top. Rinse the fish and pat dry with a paper towel. 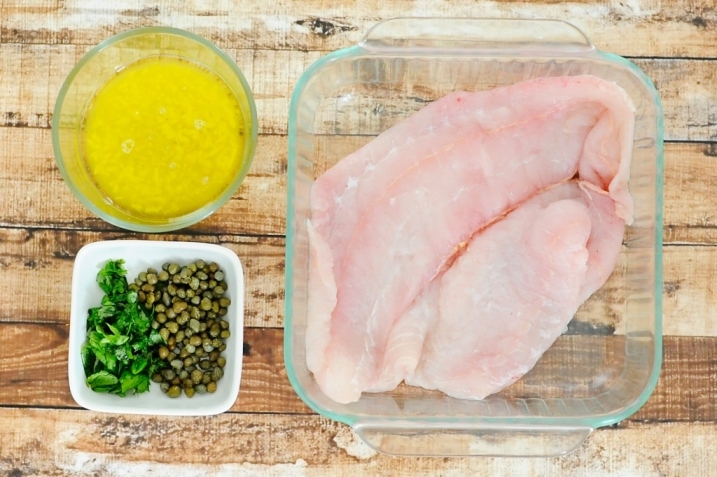 Cut fish in half and place it in a glass dish and pour marinate over the fish. 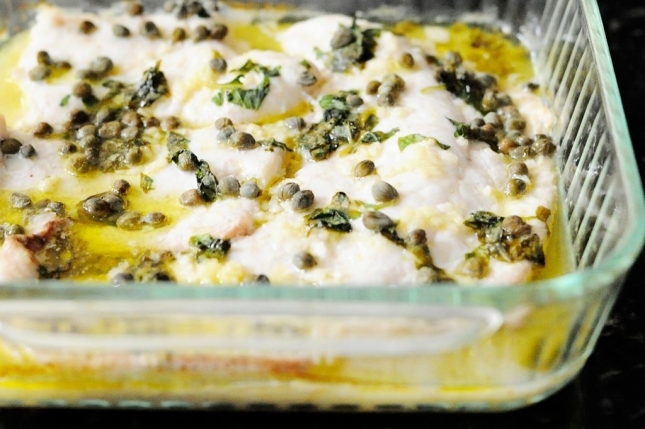 Add the basil and capers on top and bake for 10-15 minutes. It was great with halibut but I bet it would be good with another mild white fish like cod.